After a dramatic decline in numbers following their scientific discovery in 1902, dedicated conservation initiatives have ensured that mountain gorilla numbers are now slowly increasing. The mountain gorilla became known to science on 17 October 1902, and is a subspecies of eastern gorilla. It has longer hair, jaws and teeth, but slightly shorter arms, than the other subspecies, the eastern lowland gorilla. Adult males grow a patch of silver hair on their back and hips, giving them the name 'silverback'. Size: On average, adult males weigh 160 kg, and adult females 98 kg. Mountain gorillas are found at high altitudes (2,500-4,000 m) in montane forests, as well as bamboo forests. A group of mountain gorillas usually consists of a single dominant silverback male, three adult females, and 4-5 offspring. 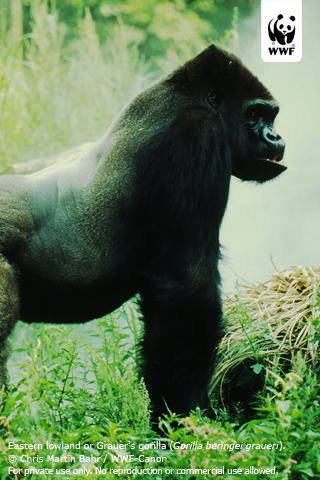 There is an overlap in group territories and the silverback generally defends his group rather than his territory. Mountain gorillas are found in two separate locations: the Virunga range of extinct volcanic mountains on the borders of the Democratic Republic of Congo (DRC), Rwanda and Uganda, and in the Bwindi Impenetrable National Park in Uganda. 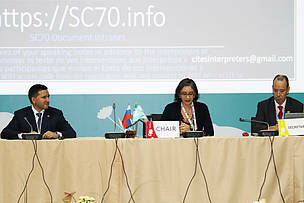 Some primatologists believe the Bwindi gorillas may be a separate subspecies. In the 100 years since its discovery, the mountain gorilla has endured uncontrolled hunting, war, disease, destruction of its forest habitat, and capture for the illegal pet trade. These factors led to a dramatic decline in numbers. Indeed, there were fears that the mountain gorilla would become extinct in the same century it was discovered. Thanks to conservation efforts, the population of mountain gorillas has increased from 620 individuals in 1989 to around 1,004 individuals today. This number is likely to be accurate, as these animals have been intensely monitored since the 1950s. The Virunga population has increased to 604, up from 480 in 2010, and lives at altitudes ranging from 2,300-4,500 m. Most of these gorillas range within the southern part of Virunga National Park, DRC, and the Volcanoes National Park (Parc National des Volcans), northern Rwanda, while a few use the Mgahinga National Park, southwestern Uganda. The Bwindi population lives at elevations of 1,500- 2,300 m. A 2011census recorded 400 individuals. Additionally, four orphaned mountain gorillas currently reside in a sanctuary in Uganda. 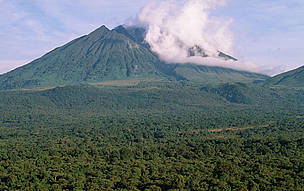 Sabinyo volcano and thick forest, Virunga National Park, Democratic Republic of the Congo. More than 100,000 people live in the remote areas where mountain gorillas are found. Their need for land to cultivate has reduced the forest in which the gorillas live to virtual islands in the middle of expanding human settlements. Between 1990 and 1994, large numbers of Rwandan refugees fled to camps at the edge of the Virunga National Park, leading to uncontrolled firewood harvesting as well as increased poaching (see below). In 2004, 1,500 hectares of prime mountain gorilla habitat were cleared by illegal settlers in Virunga National Park, Democratic Republic of Congo (DRC), according to evidence uncovered by the Congolese Institute for the Conservation of Nature, one of WWF's partners. 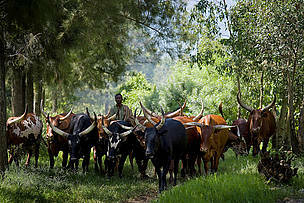 Convoys of people from Rwanda and DRC destroyed large tracts of the park, home to mountain gorillas and other endangered species, to create agricultural and pastoral land. In addition to being hunted for meat, mountain gorillas are also illegally hunted for trophies and live infants. As many as 15 of Virunga's mountain gorillas may have been killed since the outbreak of civil war in 1990. Between 1990 and 1994, when large numbers of Rwandan refugees fled to camps at the edge of the Virunga National Park, 4 habituated silverback gorillas were killed, along with some of their group members. 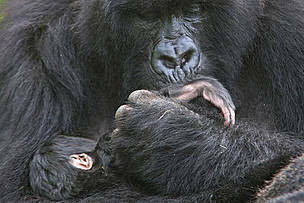 In 2007, a further 7 gorillas were killed. European oil and gas companies have been granted exploration consessions in Virunga National Park, home to Democratic Republic of the Congo's mountain gorilla population. While gorilla habitat does not currently fall within an oil concession, development in the park could negatively affect the animals' security. Although the refugees left the camps around Virunga National Park in 1996, continued civil unrest and the presence of armed militias makes survey and conservation work difficult in the DRC's protected areas, which are now in rebel-held territory. As more people move into their habitat, and more tourists come to see them, mountain gorillas are becoming increasingly exposed to a variety of human ailments. 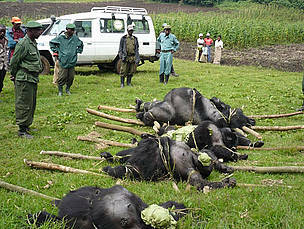 Livestock and human encroachment is a serious threat to Virunga National Park, an important protected area for mountain gorillas. 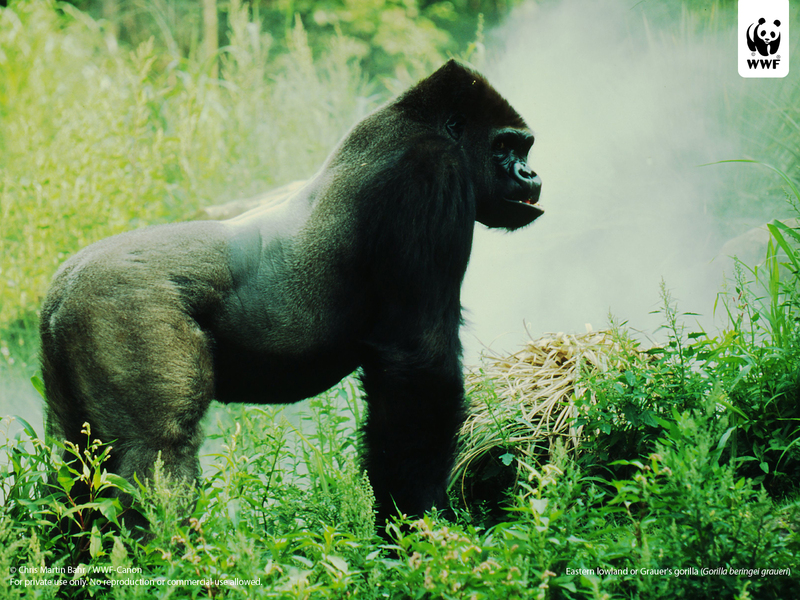 In July 2007 one silverback male and three female mountain gorillas were killed in the Virunga National Park in the eastern Democratic Republic of Congo (DRC). Our 40 years of work to save the mountain gorilla and its forest habitat represents one of our longest-running flagship species programmes. Early gorilla surveys and aid to protected areas in the Albertine Rift ecoregion started in the 1970s. In 1991, this effort evolved into today's International Gorilla Conservation Programme (IGCP), a joint initiative of the African Wildlife Foundation (AWF), Fauna and Flora International (FFI), and WWF. IGCP's mission is to empower the people of Rwanda, DRC and Uganda to jointly manage a network of transboundary protected areas that the mountain gorillas depend on. The 14% in the Virunga population over the last 12 years is thanks largely to this collaborative effort. WWF is also active in Bwindi Impenetrable National Park, Uganda, the only other habitat harboring mountain gorillas. Visit the gorillas! Money earned through gorilla tourism contributes significantly to the conservation of the species – providing funds for conservation projects and creating jobs and bringing other benefits to local communities living near gorillas.